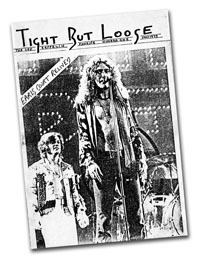 In Part 1 of the DL Reflections, I explained how by 1978, I had built up an amount of written work on Zeppelin ready to unleash my Led Zeppelin fanzine project Tight But Loose – of which a prototype first issue was already under construction. In early 1978 I replied to a query in the Wax Factor column in Sounds –one of the weekly music papers of the time. This column was run by the late Barry Lazell and basically offered information to queries sent in by readers. One such letter requested how to obtain Hey Hey What Can I Do. 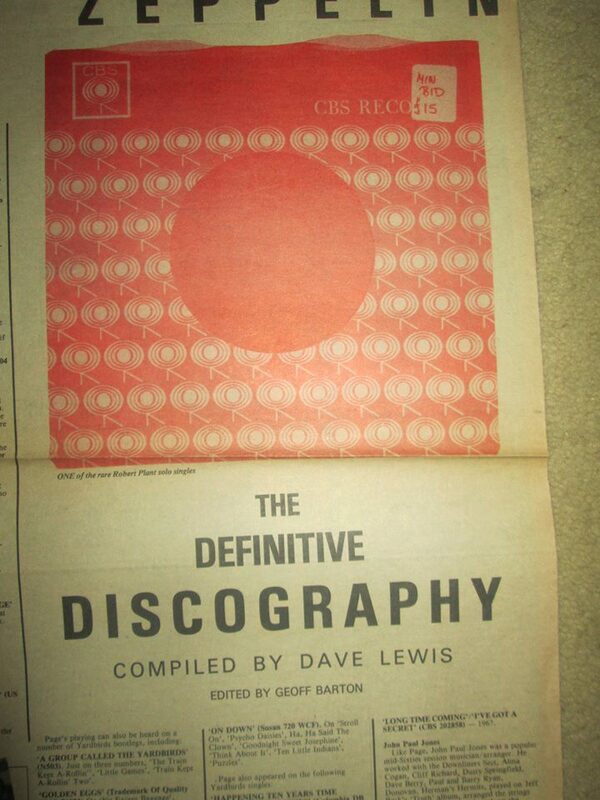 Under the guise Dave Lewis ‘’Ace Zep Fan’’ (yes it was pretentious but hey I was young! ), I replied giving the correct info. I made similar correspondence with Barry over a query about the Blueberry Hill bootleg– both of these were published. In late May (around the time of my leap of faith with The Who at Shepperton), I received a call from Geoff Barton one of the main writers at Sounds. He had evidently seen the Wax Factor replies and wanted to enlist my assistance on an upcoming Led Zeppelin feature. This was to be an ambitious three week series celebrating the band’s tenth anniversary. The brief was for me to supply a timeline history of the band for Geoff to work with plus a full discography – I suggested to Geoff that we include a bootleg listing and other pre and post session details. I’d only ever seen the basic Zep discography and I saw this as a major opportunity to present an extensive showcase of the band’s recording history to that period. On June 8th I met with Geoff Barton at the Sounds office in Long Acre Covent Garden, to discuss all this at length.. I took in a whole load of memorabilia for them to photograph to illustrate the feature – programmes, photos and a fair few vinyl bootlegs (no jpeg scanning in those far off days!). Looking back I was a bit naive entrusting them with all this and one or two items did go missing. Back in the Dents Road bedroom during the summer of ’78, I set to work on collating all the info required – all hand written I might add. It was a real thrill to be finally finding an outlet for the masses of info I had collected and logged –and knowing that it would be seen by fans across the country. I was also in touch with Swan Song and told them of my involvement. I have to say there did seem some tetchiness between Sounds and Swan Song – not that it was any of my business – this uneasiness would later result in Sounds being banned from having press passes for Knebworth – which is another story altogether. So, by early August all my info was at the Sounds office ready to be incorporated into this lavish series. Boy was I excited. 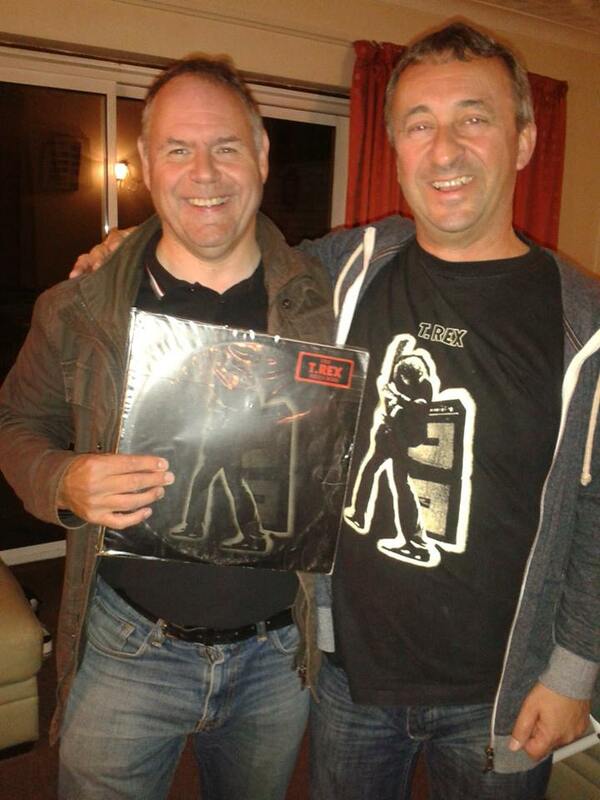 Week one kicked off with a re appraisal of the Zep albums to that point by Geoff Barton. 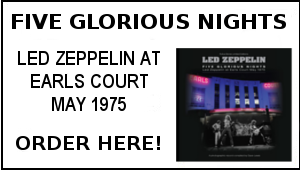 As the ordinal blurb put it, ‘ Geoff gives the albums a going over….he did that alright and for someone who was pretty defensive of any criticism of Zep – I was a little surprised at his often negative comments. Song Remains soundtrack got 2 stars Physical Graffiti 3 stars and Presence 2 and a half. 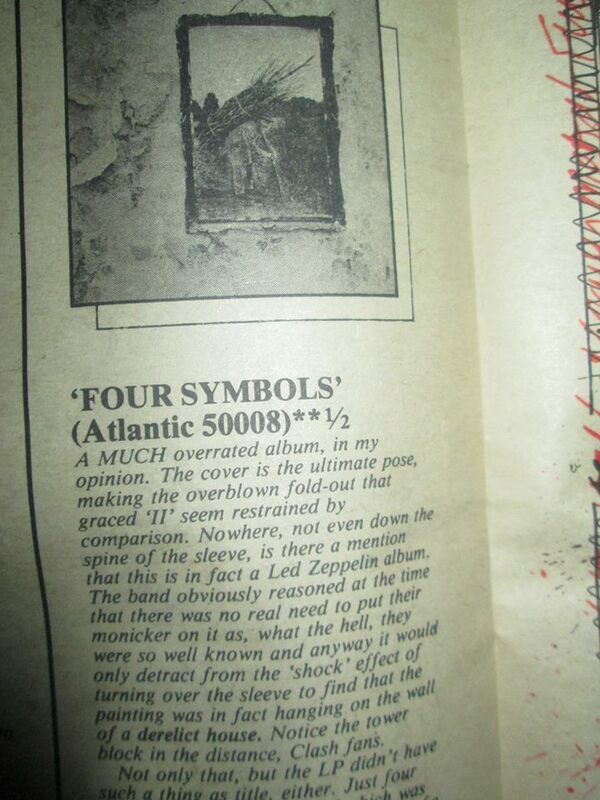 Geoff’s alliegence was clearly for early Zep where Zep I was four and a half stars, , Zep II five and Zep III five. It’s worth noting, that Sounds was one of the music weeklies facing an identity crisis in the wake of the punk/new wave explosion. Zep of course were seen as the dinosaurs of the old wave and there were some agendas at play in how they were being covered. Sounds would later develop a platform for the so called ‘New Wave of British Heavy Metal’ pioneered by Geoff Barton himself. Oh well.. the series was up and running. Week 2 was the timeline chronology. 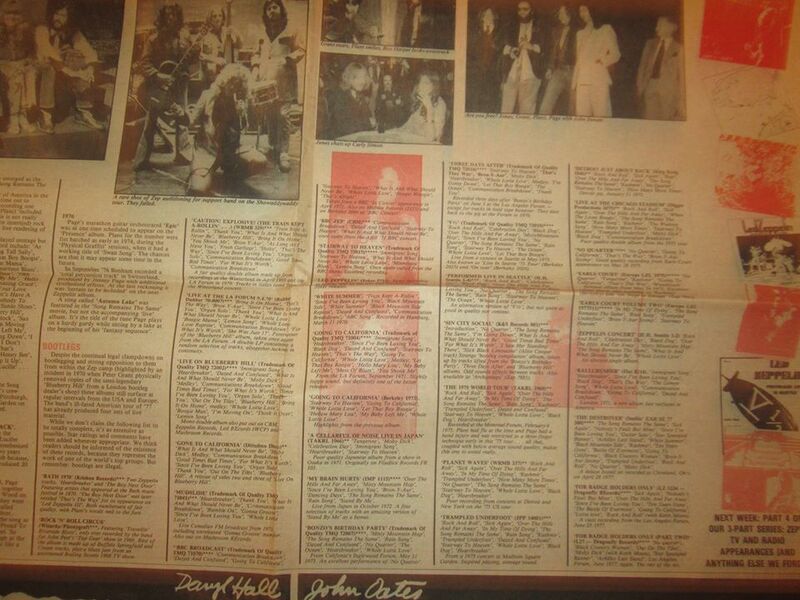 Geoff had incorporated my facts and info into the piece pretty well to unfold the Zep story but the whole feature suffered by some seriously odd lay out being spread over several pages – one page being dwarfed by an advert for a Godley And Crème album. There was good news and bad news about week 3. The bad news first: I had taken the rare Robert Plant 1967 solo single Long Time Coming for them to photograph. For whatever reason, when it came to being re- produced the whole of the CBS label was illegible –looking like a blank label and nothing else …the caption the Robert Plant rare single almost looked a bit of a tongues in cheek – ie so rare you can’t actually see it! Note also the sticker on the label which states min bid £15 which is what I paid for it around a year earlier -it’s now worth minimum £250! The good news was all the other bootleg covers came out fine and surrounded what was then the first ever comprehensive bootleg listing drawn from my research and info and own collection. It was literally everything I knew up to that point and I was also well pleased with the overall presentation of the pre Zep information and the outtakes references etc. Again this type of information had never been collated as extensively. When I visited the Sounds office around that time, I did point out to Geoff about the uneven lay out and the record sleeve problem. Frankly he was not that receptive with such criticism.I was learning fast that these guys were under pressure to produce a weekly music paper and time was not of the essence. ( Geoff and I have since laughed about this since when I’ve seen him at the Classic Rock Awards). When I was in the office, then Editor Alan Lewis suggested we run another week with all the TV and radio info I had supplied –so the three week series became four and again presented the known Zep TV and radio spots – this was a little limited in accuracy back then – I would get to know a whole lot more on the subject of the BBC sessions etc over the next few years. Another quick aside -there was a bit of confusion of names going on at Sounds as they already had a writer named Dave Lewis (no relation) working for them at that time – he went on to be a press officer at RCA Records. Many is the time down the years I’ve been asked if I worked at RCA! Following the running of the series two things happened. Firstly, I began to get letters and correspondence via Sounds from fans requesting further info and discussing the info I’d presented. 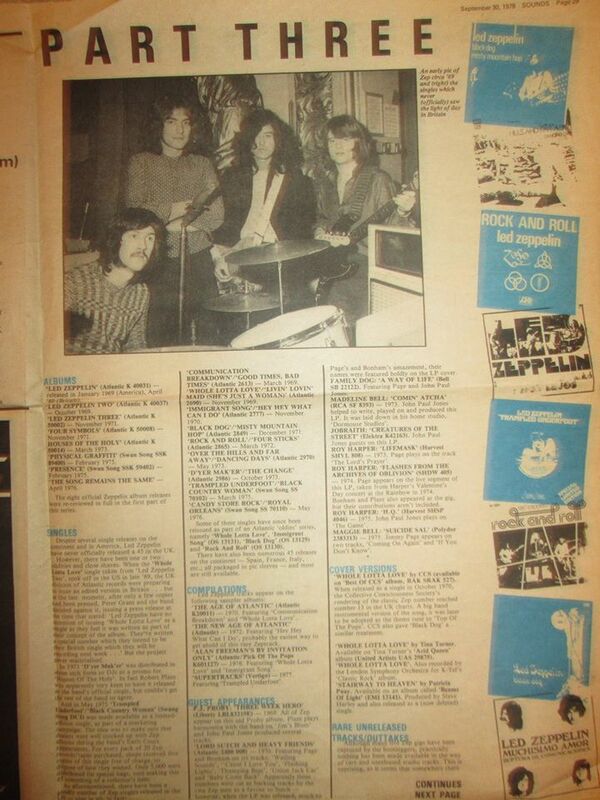 It’s worth mentioning here that being a Zep fan back then was quite an insular thing. There was no social media to share this enthusiasm – I myself was in touch with a few fans notably Howard Mylett and Brian Knapp in the US. The Sounds piece did much to galvanise a lot of interest and though the feedback I was receiving , I quickly realised there were many fans out there as keen as I was on the band.. 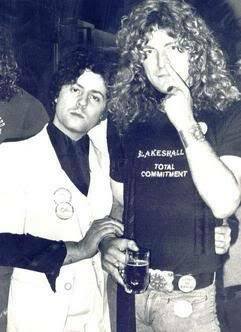 There was also a report of the very inspiring conversations I had with Robert Plant at the Goaldiggers football tournament he took part in at the Empire Pool Wembley which I attended on November 5th, 1978. The first adverts to notify the soon to be published Tight But Loose ran in Sounds and NME late in the year – there was a slight delay to getting the first issue out when the UK suffered a bout of very snowy weather over Christmas and the new year. 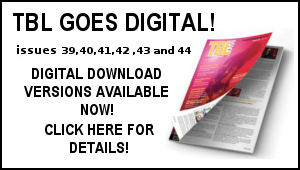 Incidentally, I do have a plan to re publish a special edition of that first issue at some point –it’s a key part of the TBL story that needs to be back out there. 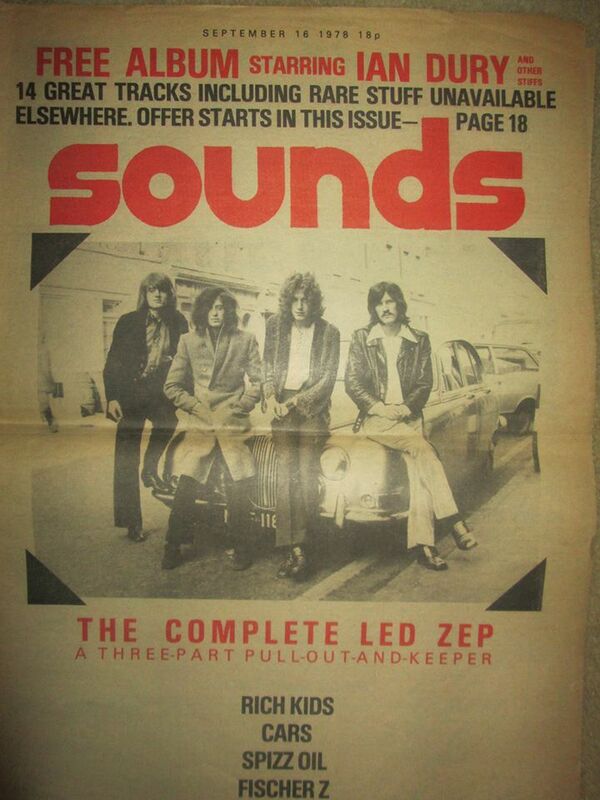 Looking back now some 35 years later, there’s no doubt that my involvement in the Sounds Ten Years of Led Zeppelin feature was the absolute catalyst for me to bring to fruition the idea to produce a regular Led Zep magazine, which I’d had kicking around for over a year. 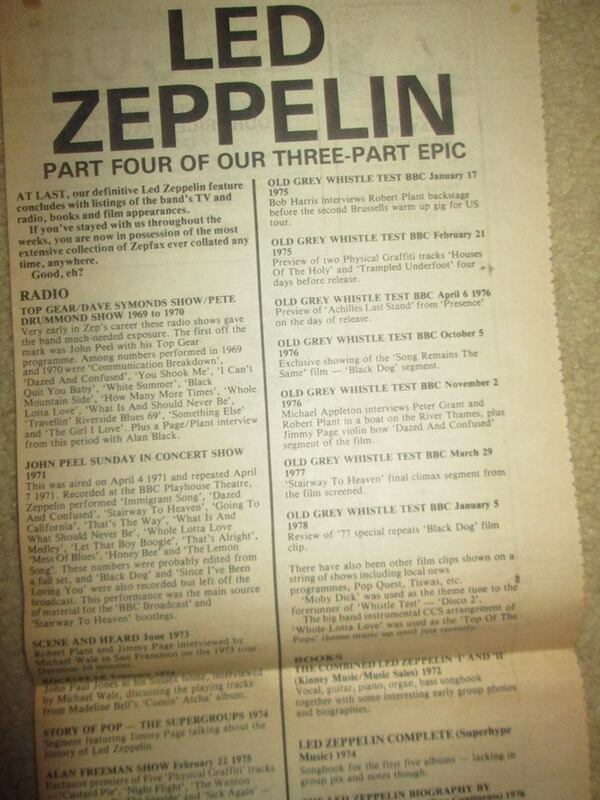 It was more than evident that fans across the globe were in need of regular Zep info and reading matter. Tight But Loose began to fulfil that role. As for the Sounds piece, I’m still very proud of it. I can recall at a UK record fair in the early 80s seeing fans with that bootleg centre page listing in the hands wading thought the LP racks using it as a guide. Eventually it would be superseded by the likes of excellent Robert Godwin’s Illustrated Collectors Guide and my own listings in the A Celebration book in 1991. 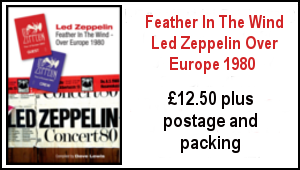 Looking over it today, it’s very evident that presenting this outpouring of Zep info in Sounds back in September 1978 was clearly the moment I broke out of my bedroom as it were, and found a true connection for my thoughts, passion and enthusiasm for Led Zeppelin. Alongside the very sad news of the passing of Steve Jump, I was also sad to learn of the death of Jackie Lomax –Jackie was an associate of The Beatles, notably George Harrison who produced his very fine solo album Is This What You Want released on the Apple label in 1968. 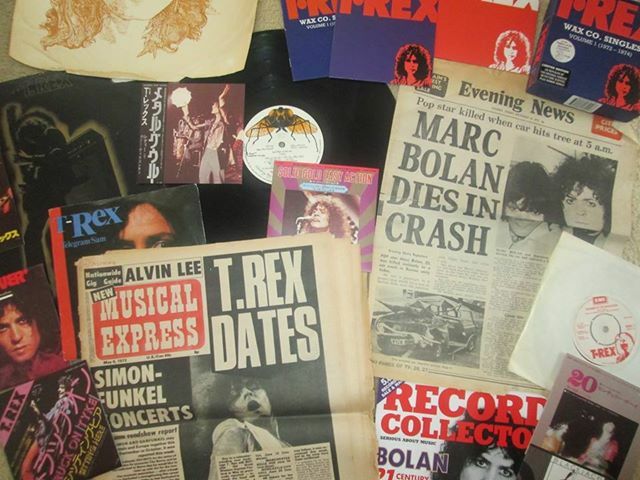 I’ve searched that one out this week for the playlist and on Monday plenty of Marc Bolan resonated around these parts, as it was 36 years to the day of his passing. After a day of Knebworth book work , I met up down the local pub with my good friend Terry – a massive Bolan fan to reminisce about the bopping elf and back at Terry’s, we also watched the afternoon show of the famous March 1972 Empire Pool T Rex concert. Superb stuff. I’d earlier put some Marc related stuff on the TBL facebook page and it was nice to receive a link from BP Fallon Marc’s publicist (and Zep’s too circa 72-74) with his web site tribute. There’s some great pics of Beep with Marc see link below. With Terry celebrating the life of Marc Bolan- Sept 16th 2013. 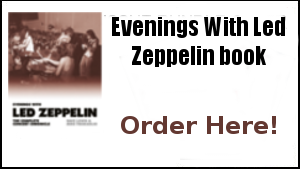 Also on the player –the Zep Sept 19th Madison Square Garden shows (more below), Bob Dylan Another Portrait, The Best Of CCS –the 70s Alexis Korner led collective with top notch cover versions of Whole Lotta Love and Black Dog – thank you Andrew R!) Stephen Stills Just Roll Tape and the latter’s new group The Rides. Following the T- Rex celebration with Terry , I was back here for a late night skype session with Mike Tremaglio on the Knebworth book. Mike has done an absolutely fantastic job on the checking of the text. The last few days has been taken up with various corrections and updates on the text with designer Mick Lowe. The end is in sight…and I hope to have firm details of all this in the next week or so. I can remember exactly where I was when the news of Jimi Hendrix death came through on September 18th 1970 – 43 years ago . I was listening to the Tommy Vance Friday What’s New programme as I did most Fridays back then eager to hear the latest single releases. Around 5pm the announcement was made on the BBC Radio One news and Tommy went on to provide a fitting tribute to the guitar legend noting the inconsistencies of his performances over the past year. Across the water the next day Led Zeppelin were performing two shows at Madison Square Garden and Robert Plant paid his respects in the evening show. ”Before we go any further …yesterday a rather uncomfortable thing happened for everybody and a great loss for the music world…and we’d like to think that you as well as us are very sorry that Jimi Hendrix went. I spoke to a close friend of his about half an hour ago and he said probably he would have preferred everybody to get on and have a good time rather than talk about it. So we’d like to get on and try and make everybody happy”. I’ve been listening to that extract of that speech on the bootleg of the evening show. They go on to perform an absolute steller version of That’s The Way with Plant’s vocals sounding absolutely incredible. ‘’I wonder how we’re gonna tell you’’ he sings slightly changing the lyrics. Behind him Jimmy strums away sweetly and JPJ adds mandolin totally complimenting the mood. That’s The Way performed by Led Zeppelin one day after the death of Jimi Hendrix is an awesome performance. Dave Lewis/Gary Foy – September 19th , 2013. 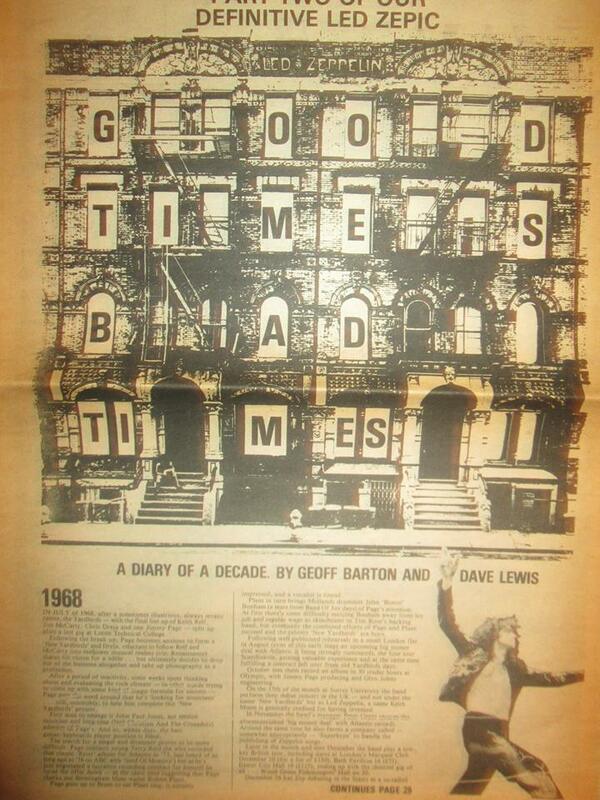 Superb piece Dave, I also had that Sounds article. Lovely memories. Mr Linwood indeed great memories! Byron – I had The Hotspur and Victory! I can vaguely remember rushing to the paper shop every Wednesday morning for the Warlord comic and sometimes Hotspur but it was during 1978 that I began to opt for Sounds or Melody Maker. I have vague recollections of these issues, as bootlegs were a million miles away from South Wales, so to read about such was pure fantasy. It wasn’t until 1980ish, after starting full time work that I began to seek out ‘Tight But Loose” – which would have been through the adverts in Sounds. Dave – the sounds edition (especially the bootleg summary) were constant references. Over the years I gradually crossed off the boots as I bought them, traded tapes etc. Great articles and great memories! And I’ve still got the bootleg summary somewhere!! Gary – no phone in our house either until 1979! Crazy days! Yes, you’re right, it was all very insular – we didn’t even have a telephone in our house back then, so it was surprising to me that there were other like-minded Zep-heads around – I had thought that I was the only true fan of the band! Best bit of todays posting; ‘the bopping elf’. LOL I cracked up at that one, nice one Dave. I so remember that Sounds feature! I still have it in a scrapbook here. I too was in touch with Howard and Brian and it was around this time that you and I swapped our first ever correspondence mate! It was about a bootleg I know that much! All the Best as ever!